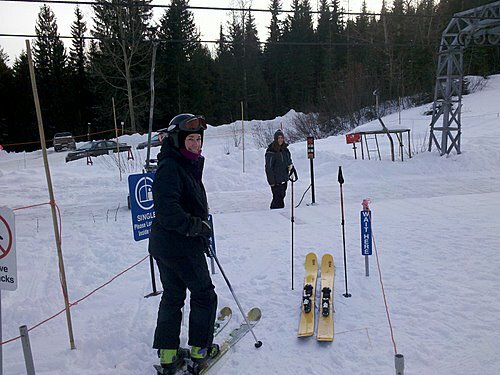 At some ski hills skiers line up in anticipation of openings, and Boxing Day can be one of the busiest days of the year, but things are different at Red Mountain. I’d heard a rumor from a friend/employee that the Red chair might be opening today. The on-line snow report said it was closed, but given the unreliability of Red’s communications of late, I chanced it and headed up for first chair. The Red chair was turning, but the place was otherwise deserted. I put my skis in line, and with a few minutes to spare thought I’d check the status of what runs were closed and what weren’t after recent snowfalls. I wandered around the base area, but there was nothing posted anywhere that I could see. I checked with guests services but they didn’t know, so asked at Ski Patrol, and they weren’t sure. None the wiser I grabbed a coffee and strolled back to the Red Chair, which was still deserted. A volunteer patroller skied through, but (no surprise) he hadn’t been told what was going on. Finally a friend (who’d also put more trust in rumor) showed up, and at 9am we were the only two skiers to load. At the top of the chair, there were rope lines strung all around the place. I asked the lift attendant what was closed and what wasn’t, but he didn’t know. So I went skiing. After a couple of runs of poking about I’d worked out where the best snow was and how to traverse there without crossing the roped closures, and I had a bunch of fun runs in variable snow by and to myself before heading home. Great piece Stew. Sums up the past 2 weeks perfectly.